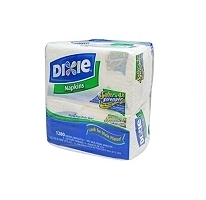 Welcome to our Cleaning & Paper products page. The items displayed represent a cross section of the products we carry. To request a price list, please do so via the CONTACT US page. 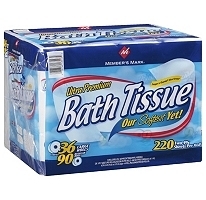 Charmin Ultra Soft Bath Tissue, 36 Family Rolls = 81 regular rolls. • Roll length: 198 sheets per roll • Quantity: 36 rolls • Ply: 2 • 36 family rolls = 81 regular rolls,198 2-ply sheets per roll • Perfect for the whole family • Safe for use in sewer and septic systems. 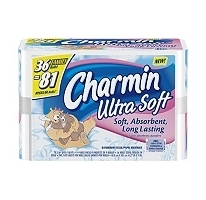 The softest and most absorbent Charmin to provide your family with a comforting touch. 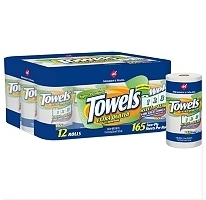 Member's Mark® Select & Tear Paper Towels - 12 rolls. Extra quilted and fast absorbing. 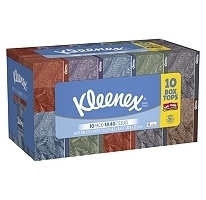 Kleenex Facial Tissue - 10 boxes/184 ct.
Dixie White Paper Napkins - 4/320 ct.
• Four times softer and stronger than the leading value brand.